See the video to see who won (besides office assistant/dog Gunner, obviously). 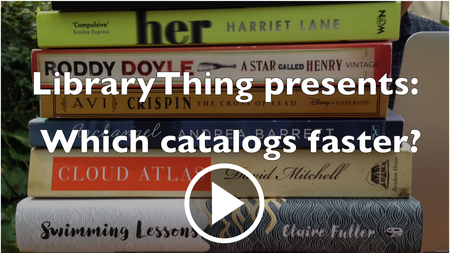 Over the years, LibraryThing has evolved to focus on cataloging efficiency, to benefit data-lovers and libraries (hey there, TinyCat) everywhere. Today, we’ve got 12 years and 117 MILLION books’ worth of cataloging under our belt. However you catalog, we’re happy you’re here with us. We’d like to send a huge “Thank you!” to all our members. You help make LT what it is—a great place to be. Grab your party hat and come share in the celebration on Talk.